Neues vom Querdenker: 20 Jahre hat der britische Ingenieur Tom Evans in die Perfektionierung seiner Phonoverstärkertechnik investiert – und das hört man. Die optisch unspektakulären Geräte stecken in charakteristischen schwarzen Acrylgehäusen, audiophile Boutique-Bauteile sucht man vergebens. Der Star ist das Konzept, eine sehr aufwendige Spannungsversorgung und ein feines Händchen für technische Details loten die Grenzen des Machbaren aus. Em Ende gibt’s ein superfeines, stets schlüssiges und homogenes Klangbild, dass jedem MC sein volles Potenzial entlockt. Die dynamische Potenz des Shiraz kam schon fast gewalttätig rüber, bleibt dabei aber völlig kontrolliert, ohne jedoch abgewürgt zu werden. Die Klangbilder dieser Kombination waren fein ausgewogen und mit üppigen Farben ausgestattet – große Klasse. Tom Evans's The Groove braucht also keine Konkurrenz zu scheuen (umgekehrt schon). Ein Phonoverstärker der echten Topklasse, der seinen hohen Preis durch eine extrem präzise und dadurch wunderschöne Wiedergabe vergessen lässt. If life is in the details, then the Groove certainly brings more life to the party than any other solid-state phono preamp I can remember. The Microgroove+ gets everything right, but the Groove simply does a better job of doing the disappearing act and letting the music through. If the Groove was just better in the midrange, for example, you could probably just use instead a cartridge (or cables, or preamp, or amplifier, or speakers) that provided that particular characteristic. But it is not that simple. When you listen to a new component, those first 15 seconds are often more valuable in judging its sound than the hours that follow. While you may not clearly perceive every nuance of the change in performance, what you immediately notice are the gross differences between the new component and the one it just replaced. When I switched to the Groove, nothing jumped out and said "check out that great bass", or "the soundstage just got deeper". There was no particular area that focused my attention on it as a large change. Further listening revealed that there are small improvements in every area. But that initial impression, one that stayed for many hours, was one of a complete picture that had the ability to bring the musicians into the listening room with clarity, delicacy, and most importantly, believability. 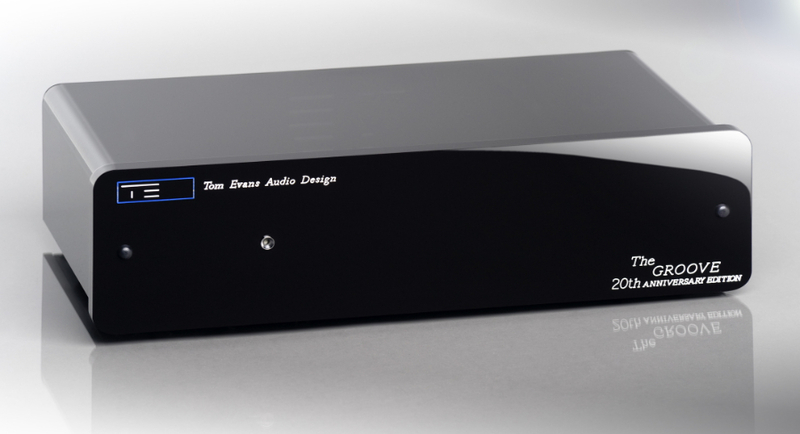 „While we are at is, I cannot say it often enough: Tom Evans The Groove phono stage is, dollar for dollar, the best buy in separate phono stages, anywhere , anyplace. You’d never know it was solid-state just from the listening. And that is the first time I can say that about a transistorized phono stage. I cannot imagine it easily being bettered. The Groove is definitely a breakthrough in vinyl replay. The Groove breaks just about every presentational rule for hi-fi gear that expects to be taken seriously in the High-End marketplace. However, its lightweight construction and diminutive dimensions are the external dressing on a coherent and carefully considered design path. The Groove is a hot-rod. There’s not one ounce of unnecessary weight, and every part is there for a reason. This product is about performance, first last, and in between. It’s light so that it stores less mechanical energy. The box is made of plastic because it sounds better, which isn’t exactly news, but it’s taking the rest of the world a while to catch on. Ultimately, it’s not its accuracy, transparency, or resolution or dynamics that make the Groove superior to the other phono stages I’ve used. It’s the way it uses those attributes in combination. It makes more sense of the signal, making it more engaging and communicative. It’s at once more natural and more intelligible. Thos is an instance in which accuracy to the fact of the sound doesn’t exclude accuracy to the spirit and life of the performance. I used to think I knew what vinyl sounded like. Now I recognize that its “shortcomings” had more to do with the phono stages I was using. The Groove lets me hear more of the music, and more of exactly who is doing what. In short, it makes more sense of and delivers more of the performance. The Groove isn’t just a new phono stage, it’s a whole new record collection. While DVD-A and SACD do battle, good ol` vinyl just upped the ante. So how does it sound ? The Groove goes strait to the heart and soul of the music, and shows that the designer is a true vinyl lover. The Groove was able with an accurate neutral balance, to capture more of the dynamic impact, punch, air and transparency of the best LP’s than almost any other phono section I’ve heard, along with superbly defined and visceral bass response (on the best discs, you can be fooled into thinking you are listening to top digital bass). ... there is just no competition. The Groove will re-write what you think is possible from vinyl. The phono stage happens so early in the process that it forms a gate that defines the performance of the entire system. What I’d assumed were the much trumpted shortcomings of vinyl were actually limitations in the phono circuits we’ve all been using. The Groove doesn’t just open the gate, it takes it off its hinges, flattens the posts, tramples the walls and sets free the livestock. Dynamic range ? You’d better believe it. Musical coherence and inner detail ? In spades. Natural harmonic envelope ? If it’s on the recording. In fact, limitations in the recording start to outweigh the limitations in the system; each and every track becomes a distinct and separate occasion. So choking is the influence of the average phono stage that I was shocked to discover The Groove redefined the performance potential of not just the whole system, but my record collection as well. But the real significance isn’t in the blackness of the background itself, but in the contrast it provides for instrumental details and dynamics. The lack of noise and grain allows the subtlest of details to emerge, the individual colour and harmonics of an instrument, the precise timing and leading-edge of a note or breath. It is the fleshing out of the music with these micro-dynamic detail, hung on the precise temporal structure already provided by the standard Groove’s superb musical architecture that breathes life to every note, every instrument, every performance that passes through the Groove Plus. It matters not how many records you play, the results remain the same. From the first note you hear to the last, each will be its own little revelation. The bowing of violin or cello, the strike of stick on drum, the catch in a voice or finger tips against strings: all are captured and caressed rather than imprisoned. The Connoisseur is without doubt the finest phono-stage I’ve heard. The Groove narrows the gap considerably, especially if (and like the Connoisseur) you use it with its matching line-stage. The musical journey that started with the Iso has come full circle. The Pulse finishes what the Groove began. Im Hörraum reißt er's raus, der Tom Evans – gar keine Frage: Was der Herr hier aus drei Achtbeinern pro Seite zaubert, das darf als außergewöhnlich gelten. Der MicroGroove erzeugt eine fantastische Synthese aus Kraft und Geschmeidigkeit, er liefert Druck bis in die untersten Regionen, aber ohne auch nur im Entferntesten die Differenzierung zu vernachlässigen. In den mittleren Lagen das Gleiche: Schwung, Grazie und Ausdruck, aber immer perfekt aufgeräumt und stabil. Wir wissen zwar nicht warum – aber das unscheinbare Gerätchen ist große Klasse. The bass is excellent - tight but resonant. Bass strings vibrate with considerable realism and drums have great punch and weight. The midrange is rich but very well focused. Male vocals have a tangible, harmonic depth that is usually absent. The entire treble range has excellent resolution and is absolutely grain-free and very pure and open. Cymbals never sound like white noise, but ring true. The overall balance from deep bass to high treble is exceptional and "of a piece". Soundstage focus is spot-on. I will take a chance here and say that soundstage depth is just a gnat's wing shy of the better tubed units, although the Microgroove+ more than compensates for this with it's much lower noise floor. But honestly, this is reaching for something to criticize. The Microgroove+ is consistently enjoyable and entertaining. I found myself turning up the volume and just being immersed in the music, and I always wanted to listen for longer than I could at the time. In every subjective parameter, this is an excellent product. One thought came to me again and again as I listened to this phono stage. If for some reason I had to get off the audio train and live with the gear on-hand right now, it would not be a problem. A good value at $1900? Absolutely, yes! This phono stage does some truly satisfying justice to the Classic Records 180gram re-issue of the Led Zeppelin II LP. Faint nuance and details are brought into a high resolution focus, all the while lending deep reserves of energy and drive to the dynamic transitional passages the album is chock full of. Speaking of transitional passages, most Led Zep fans will mention "Ramble On" as one exceptional track that show-cases the group's dynamic capabilities in the art of transition. It's the contrast between the cozy acoustic guitar and gentle vocal getting aroused into a full-on screaming hard rock number carried up on the back of Bonham's energetic percussion licks. The harmonica in "Bring It On Home" is shockingly real and at times in the room breathing air, blowing chords and flying around the width boundaries of the soundstage. Stereo effects like these are done to an even greater effect in "Whole Lotta' Love" with it's stunning percussion solo, numerous ringing cymbals, some which are impossibly soft yet focussed, playing hide and seek in the three dimensions of the soundstage. Finally, the last energetic transition happens in "Bring it on Home". With a pair of rim shots, Bonham launches another high volume, full bore wailing screaming hard rock finale. I defy any Led Zeppelin fan to hear this album through the Tom Evans phono stage and keep their feet still. I sure can't. Tom Evans rocks...! The Tom Evans displays music truthfully with tight textured bass, pristine transparent midrange and high frequencies. No roll-off. No grain. It's not overly analytical. It has a very quiet background. It is highly detailed and it brings music alive with it's ultra-fast transient response. It is also revealing and will tell you truthfully what is on your records. What more can anybody ask...? Hey it rocks with the best of them and then turns around and plays blissful, beautiful classical music. Never has the system dug so much detail from the grooves of my much valued record collection it does with the Lithos equipped Microgroove Plus. .....Comparisons between the standard 'Micro-Groove' and the 'Plus' version are little short of astonishing, considering that the signal circuitry is identical. The Iso established itself as the benchmark for acceptable phono performance, a position that was never seriously challenged. The `MicroGroove' comfortably inherits that mantle, but the `Plus' is something else entirely. Compare the two and you'll I see what I mean; get used to the `Plus' and you'll wonder how you ever found the cheaper models acceptable. So what does the Lithos regulator bring to the party, apart from a blue LED rather than the standard green one? In a word, clarity, but clarity in every sense. There's an obvious gain in transparency and solidity of the images, and the whole sound stage becomes far more defined and stable. But these are merely the most obvious symptoms. That improved definition applies to the leading edge of notes, their harmonic envelope and decay. In other words, the `Plus' has far greater low-level accuracy, and here's the interesting bit; unlike most "accurate" hi-fi which generally sounds as dull as dish-water, the Lithos-ed `MicroGroove' sound altogether more musical and involving. The dramatic increase in low-level resolution produces music that is full of immediacy, presence and sophistication. Now the immediacy and presence are easy enough to understand, given the increased transparency and harmonic definition, but what's this sophistication? The increased definition of individual notes has clear temporal as well as spatial implications. Because we can now tell so much more clearly where individual notes start and how long they are sustained, the relationship between notes, and precisely where and how the musicians place them becomes much more apparent. This provides a direct insight into the chemistry of the performance, the interplay of the musicians, bringing the whole thing to life. Forget rhythmic integrity as an issue, here's the entire musical skeleton, clear to see. (For more on-this see the reviews of the Final Music amplifiers in Issue 2, and `The Groove' in Issue 4.) The `MicroGroove Plus' might not match the astonishing, almost master-tape solidity, presence and authority of its more expensive brother, but it gets you a fair way along the same road. In order to understand why that should be, it's necessary to appreciate exactly what the Lithos regulation achieves. Built from fifty discrete components onto a small pcb, the Lithos circuit is around a thousand times quieter and fifty times faster than the high quality Linear Technology 317AT/337AT ICs used in the standard `Micro-Groove', and those are amongst the best conventional regulators available. The result of this is that not only does the circuit running from the Lithos regulator get power devoid of the overlaid ripples and distortion that the vast majority of signal circuits have to tolerate, but the circuit can react faster and to smaller signals, retaining their contribution and correct position in the overall picture. Its this that makes the `Micro-Groove Plus' sound so stable and immediate, and makes it communicate the musical message so directly. It's this which moves you so much closer to the original performance. If the `Micro-Groove' establishes a new benchmark, then the `Plus' sets the standard for others to aspire to. No it doesn't match the astonishing performance of `The Groove', but then it doesn't cost £1500 either. What you get at £700 is enough of `The Groove's attributes to seriously embarrass the (much) more expensive competition. You also get an immediate improvement in the performance of every record you own. Remember, the Lithos technology means that the `Plus' provides performance potential that simply isn't possible from phono-stages using conventional regulation. This isn't just an upgrade, its a new set of rules. The standard `Micro Groove' extends the Iso's reputation and is a very worthwhile evolution. The `Micro Groove Plus' is a far more radical beast. It brings the revolutionary technology of `The Groove' down to a far more affordable level, and lets you get there by stages too! Believe me, you really haven't heard what's on your records. Even without the Pulse the Vibe is good enough to be compared with any sub 15K € pre out there…. But add the Pulse and you are talking of an entirely different level of performance altogether. Along with even blacker backgrounds the Vibe gets a shot of adrenalin that energises it even further. The Groove Vibe combination gives you full value for what’s on the record, but never over eggs the pudding. It simply provides an outstanding vivid , tactile and engaging performance, releasing the artist intent from the shackles of what have always seemed like indifferent recordings and pressings. But if musical communication and performance is your primary aim then it performs to a standard that challenges the very best. Use it with the matching phono stage and a decent record player and you’ll hear something really quite extraordinary. I’ve been using the Vibe in my system for two months, and it’s been a revelation: effortless extension at both frequency extremes, with an astounding ability to reveal inner detail and rhythmic nuance, and the best bass articulation I have ever heard. Adding this component elevated my system from being merely “very good” to among the best I’ve ever encountered. I don’t believe it can get much better. Play something familiar and the first thing that hits you is the sheer physical substance and rock solid stability of the sound. This level of bass definition and transparency only normally comes from very large amps indeed. But here you have the speed and impact, the dynamic jump of a small amp. It is the solidity of the foundation that is delivering the quality, and that is a direct result of the amps ability to grip and control the speakers. The Linear A is an exiting product and not just in the musical sense. Select your speakers with proper care (a caveat that applies if you want to get the best out of almost any worthwhile amplifier) drive it from a Vibe and ideally a Groove too, and you’ll have access to genuinely high-end performance at a fraction of past prices. This amplifier represents another huge step in the process of making high-quality audio more affordable. Along with all the traditional strengths of a low-powered amplifier, you also get the resolution and noise performance of the other Tom Evans designs, coupled in turn to the stability, transparency and authority that normally only comes from hugely powerful and hugely expensive alternatives. Less fashionable and less pretty than the various alternatives, it is also half their price, but get it working at its best and it’s one of the biggest bargains out there in high-end audio land.